There is a lot of talk on sustainable everything – sustainable building, living, development, etcetera. But how about sustainable eating? In this blog post, I will introduce you to India’s dabbawalas, a symbol of enduring sustainable eating practices. A burgeoning economy, modernization, and urbanization accompanying increased wealth of a city and its inhabitants can be associated with a change in eating patterns. Processed foods become prominent as time becomes scarce, along with the proliferation of fast foods from the Western world. An urbanized city, is, after all, a global one, and what ‘global city’ doesn’t have numerous McDonald’s, KFC’s and Pizza Huts? Foods, once farmed and harvested in or close to cities have to be transported over increasing distances. Additionally, with wealth comes the demand for and ability to purchase ‘foreign’ foods – this may include specialty items or seasonal produce to feed season-less cities (Singapore included). While it looks like our eating practices are all set to become more unsustainable as more people live in cities, Bombay, however, is somewhat an exception. Though there is no shortage of restaurants to feed the city’s professionals, tiffins remain ever popular, even with increased spending power. We know ‘tiffin’ the object (stacked steel containers), but ‘tiffin’ the concept, is not popularly known outside its country of origin – India. ‘Tiffin’ the word is an India-derived noun, much like ‘pyjama’. Its earliest recorded use was in 1811 British India, not too long after the British established themselves in India in the late 18th century. English sahibs now had light lunches instead of afternoon tea, marking the birth of the ‘tiffin’, a term referring to this new practice. ‘Tiffin’ arose from two slang words, ‘tiff’ and ‘tiffing’, both referring to diluted liquor and the act of drinking it. ‘Tiffin’ then evolved into a complex concept involving an array of dishes, equipment, dabbawalas, chaiwalas and the like. Today, ‘tiffin’ refers to both lunchboxes, typically consisting of 3 or 4 steel stacked compartments, and a packed lunch. ‘Tiffins’ as they currently are, is very a much product of Indian cultural practices. Lovingly prepared, home-cooked food is not only healthy, but is considered highly superior to purchased food. 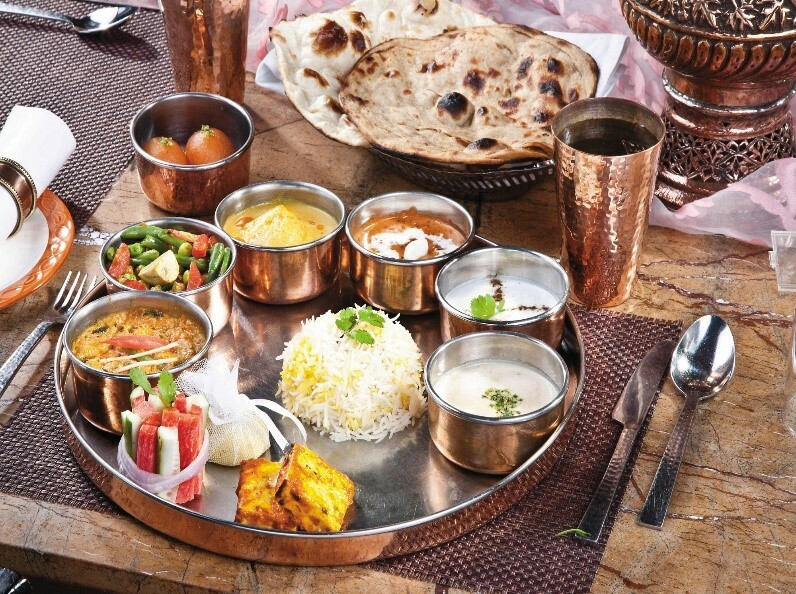 Tiffins are also highly suited for the thali-style eating practices in India consisting of a selection of breads, rice, vegetables and pickles, amongst others. 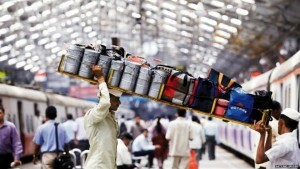 And every day, dabbawalas (or tiffinwalas) tote thousands of tiffins to hungry office workers. Just who are the dabbawalas? 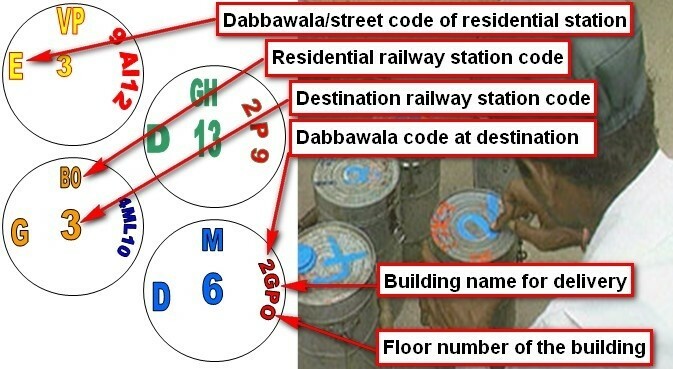 Dabbawalas are easily identifiable. Outfitted in white kurta pyjamas with a matching white Nehru cap, they arrive on bicycles, every morning at homes, and every afternoon at offices. Tiffins are collected from homes after office workers, who often live more than 50 km away from their workplaces, have left the house. There is simply no time for full meals to be prepared for very early, long commutes. Dabbawalas number in the thousands, forming an impressive, intricate food distribution network. Strikingly, almost all dabbawalas hail from the same small village near Pune, four hours away from Bombay. Most are related to each other, and families have had this profession for generations. Dabbawalas are mostly Hindus who belong to a lineage of warriors. Their customers, along with the tiffin contents though, reflect Bombay¹s mixed community including Hindus, Muslims, Sikhs and Jains. These men, ranging from boys to the elderly, each carry in a basket, 45 tiffins on their heads weighing up to 90kg while food is transported and sorted at railway stations (this is why dabbawalas wear caps!). Tops of tiffins are colour-coded and hand-painted with home and office addresses and railway stations where they should be delivered and collected. This information is condensed into a small series of letters and numbers, forming a sophisticated code. Hot home-cooked meals are delivered to more than 200,000 hungry, desk-locked office workers by 12.45 pm, and empty tiffins are once more collected to be returned to their respective homes. Dabbawalas are so trustworthy that workers would rather bring home their wages through emptied tiffins on its return journey than carry money with them on their trains home. 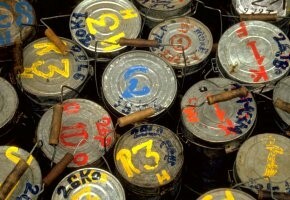 The error rate in this food distribution system is extremely low at 1 in 6 MILLION delivered tiffins. Bombay’s dabbawalas have even won international acclaim from Forbes, which awarded dabbawalas a 6 Sigma performance rating, a rating only given if success rate is 99.9999999 % or more. Motorola was given the same Sigma rating. Tiffins spread across India, including into my mother’s Pakistani family. Tiffins are thus a familiar concept to me, though slightly tweaked to suit both my family and the local context. Instead of tiffin lunches, my family has tiffin dinners cooked by my grandmother daily. And just like the busy workers of Bombay, our tiffins were created for my working mother. Cereal prawns, char kway teow and other local fare share tiffin space, and have even more prominence in our tiffins than the traditional dals. And since there are no dabbawalas in Singapore, every evening, one of my brothers or I do the job of the dabbawala – collect and return, though not on a bike. Traditionally, a tiffin is packed, from bottom up, with rice or bread, salads, a curry or dal, and, if lucky enough to have a fourth layer, something fried and crispy (my favourite). Tiffins are the ideal sustainable lunchbox – compact, reusable, hygienic, and very long-lasting. It also retains the freshness and warmth of home-cooked foods so re-heating is unnecessary. It is no wonder these steel compartments are traditionally non-microwaveable – there is simply no need for it! Tiffins, through reducing takeout, reduce the need and use of Styrofoam, plastic, or paper containers. Single-use containers are almost necessary for takeout. Reusable containers are often not greeted with pleasure in restaurants because of possible health implications (who is to blame if food from reusable containers make you ill?). I also think reusable containers are unwelcome because restaurants do not want to ‘over-portion’ your takeout! But these single-use containers all have an ecological price. This includes the energy and (often non-biodegradable and non-recyclable) materials used to produce them and the resulting landfill waste they contribute to once used. And by reducing takeout, tiffins also reduce food waste. The tiffin and dabbawala system is additionally sustainable as the process, involving the bicycle as the main mode of transportation, is sustainable and eco-friendly. It also provides lifetime employment for many. Sustainable livelihoods and lifestyles are thus supported by this system. With tiffins, there is no excuse for measly sandwich lunches at our desks. Tiffins also beat Pizza Hut delivery, McDelivery, and other restaurant delivery systems (which come in countless polluting motorised vehicles) in terms of taste, selection, price and health value. 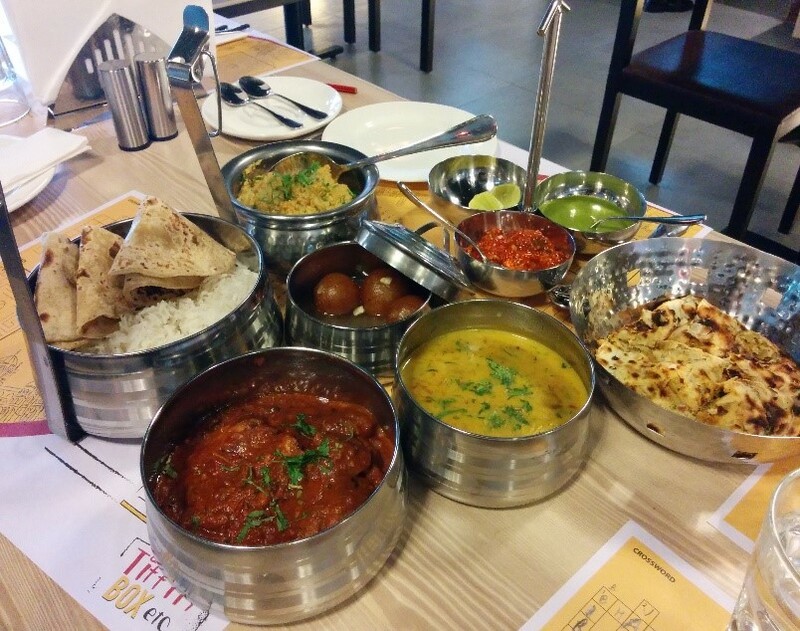 Tiffins have an additional plus – they are prepared by someone who cares for you. Who wouldn’t and doesn’t crave a piping hot home-cooked meal from someone who loves them? And as someone who enjoys dreaming up perfect meals (as all of us do), I look forward to planning and creating my own tiffins. Happiness to me, is, after all, loving and caring for someone, which includes feeding them well. Knowing that I am also living sustainably (at least for the eating part of my life) makes me even happier. All will be washed down with homemade lime juice! 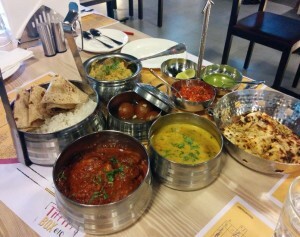 How would you sustainably eat, and what is in your dream tiffin?